IMP GR PC O’NEILL’S GR PR ZAWADI OLYMPIA (76 30). A girl who poses well. Slight rounding to top of head between ears of good shape and set, slightly large in size. Large green eyes of rounded oval shape, set well apart. Small head in comparison to body, as desired, short muzzle with definition to whisker pads. Slight contour to nose line in profile with good chin. Dark golden coat with well defined black and darker brown spots and markings, including arrowheads, broken and unbroken necklaces. Coat is dense and pelt-like, of good texture, rufus tone to tummy which is well spotted. Good shape and length to well marked tail. Handled well. IMP O’NEILL’S GR PR ZAWADI OLYMPIA - 76 30 - FN. 17.08.2008. 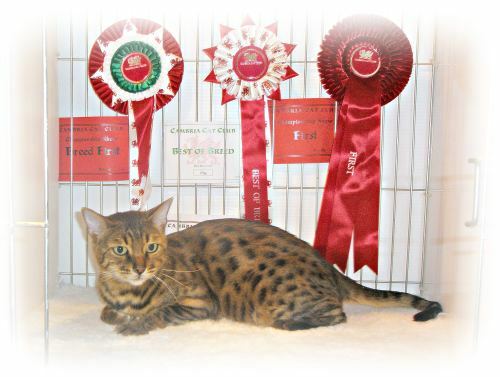 Mature spotted Bengal female with a good broad medium wedge head with well set neat ears. Good profile line. Large expressive well set light green eyes. High cheek bones. Level bite just minus one incisor. Lovely deep chin. Sleek muscular body of good length.Medium length strong legs and rounded paws. Medium length thick tail tapering towards tip. She has a dense coat with a lovely texture. Very good spotted pattern with good head and facial markings showing spectacles around her eyes and pale around her muzzle. Tail well ringed. Shown in excellent condition and easy to handle. BROWN SPOTTED BENGAL NEUTER FEMALE. 1ST.PC. O’NEILL’S ZAWADI OLYMPIA. 170808. A very gentle mature girl. Medium wedge with rounded contours, profile has a gentle curve from forehead to bridge of nose, nose large and broad slight concave curve, fairly strong muzzle firm chin. Ears quite short and wide at base good set, eyes expressive showing good colour. Overall balanced body, good condition, strong legs and balanced tail. Coat very good texture and presentation, body showing rosettes and arrow head spotting, some linkage, clearly defined facial markings, rufus colouring and showing gold dusting.